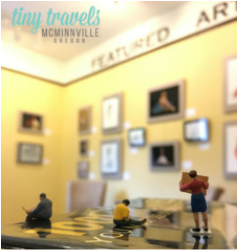 I do this travel column for Visit McMinnville, short stories of place I'm writing about living big in a tiny Oregon town. Here's where it all starts. My desire to stop cruise directing and act more like really a clever butterfly on some rad wallpaper. This is where I try to coin the phrase "destination baked good." Much more than the wine country vista, the oak grove is the Ur-Oregon. In what feels like a season of division and torment, I am thankful for this place in my hometown. Travel is one of the best thing you can do for your mental health, and if you’d like to pair escape with a physical health regimen, I’ve got just the places. Here’s a full-day detox program in McMinnville, fit for travelers. The first rule of Galentine's Day is: You have to talk about Galentine's Day. The right mix of places, people and attitude make for one hot dish, perfect for grey days cut through with an occasional rainbow.